I have always had a really difficult time sticking to my goals and creating new habits. It's frustrating to me, but I recently discovered the reason for that. I have been reading Gretchen Rubin's stuff on book on habit forming (See the book here: Better Than Before), and she is a goldmine of information for people who are looking to finally form some good habits that will actually stick. 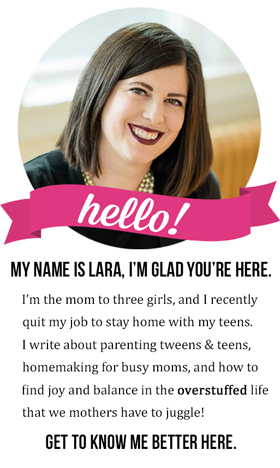 On her website I found a quiz that tells you what tendency you have regarding habit-forming. As it turns out, I am an obliger. An obliger is somebody who easily meets the expectations of others, but struggles to meet expectations they impose on themselves. This came as absolutely no surprise to me. I am a chronic people pleaser who struggles to say no to others and constantly puts my own goals and to-do lists very last. The thing is, I get so frustrated when I spend my day meeting the needs of others and doing absolutely nothing that I really wanted to do to attain my own goals. I am definitely an obliger. Gretchen says that obligers need external accountability and that they do much better when they have it. So I have been working on finding ways to be more accountable to myself. If you're not sure that you can handle actual external accountability yet because that means letting someone else in on the goals, habits, and resolutions you are working on, try to at least use a chart. You can make a simple chart to keep in your planner or to put on your fridge—somewhere where you know you will see it often and remind yourself that you are working on these goals. I also like checking things off on charts. Just like little kids love using chore charts and checking off the chores they completed, it gives me a little thrill to check things off my goal charts. 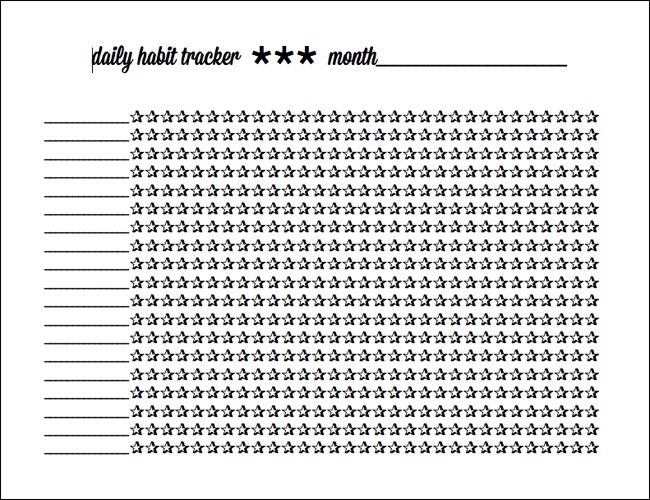 I've made a habit tracking chart you are welcome to download and use for this purpose. 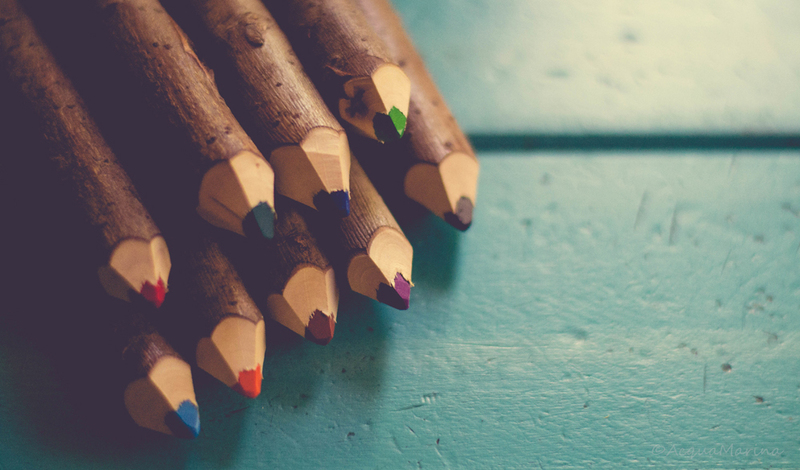 The idea is to write down the habits you're working on and then color in a star for each day that you were able to keep that habit. There are 31 stars in each row, enough to track your progress for one month at a time. It's easy and motivating! Enter your email into the form below and the chart will be delivered straight to your email inbox. If you are on a mobile device, click here to see the form. Just telling someone that you intend to do something is often enough motivation to complete a goal. It's embarrassing to see that person and have them ask you about it only to say, "Oh—I haven't gotten to that yet!" Telling people my intentions really works well for me—that is actually one of the great benefits I have found of being a blogger. When I write my intentions for the entire internet to see, I automatically feel much more accountable. I'm not saying you need to start a blog so you can keep your goals (though it isn't a horrible idea), but I am saying that public declarations of goals keep you accountable. Perhaps a Facebook status or a deliberate mention to your best friend will be just what you need to start getting up earlier. 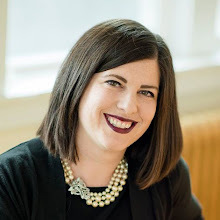 My friend Annette wrote a book about accountability partnership and it is genius! (See the book here: Done and Done only 99 cents on Kindle!) I have another friend who also tested as an obliger and we have been FaceTiming each other once each week in order to keep ourselves accountable to our goals. We also text sometimes, and when I'm back home in Michigan, I'm sure I will talk to her about things in person much more often, too. This really works. When I know I have a FaceTime date with my friend and that I will have to tell her that I didn't keep a certain goal or do what I said I would do, it motivates me to do better next time. You could also join an accountability group. Maybe form one yourself on Facebook or find a public group of people that are working on a similar goal. I actually heard a news story the other day about Instagram dieters. They are much more successful with weight loss because they are both accountable and anonymous. These types of groups where you don't know people personally can really help those of us who are too private to share our goals with those we know in real life. I found that this method was least effective for me—I think anonymous accountability doesn't work for me because I don't care what those people think. I joined a health challenge last year where you got points for doing specific things and even though I paid money into it, I just wasn't super motivated and it didn't bother me much to tell my group that I had completely failed! 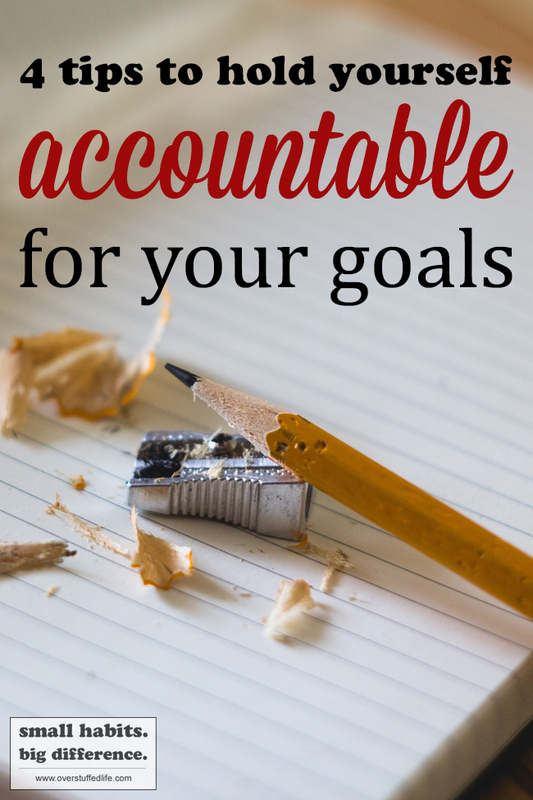 The point is to find a method of accountability that really helps you and then go for it. Make those goals and habits realities! 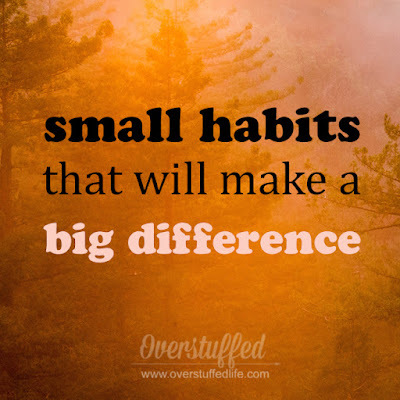 This post is the final installment in my Small Habits That Will Make a Big Difference 30 day challenge. 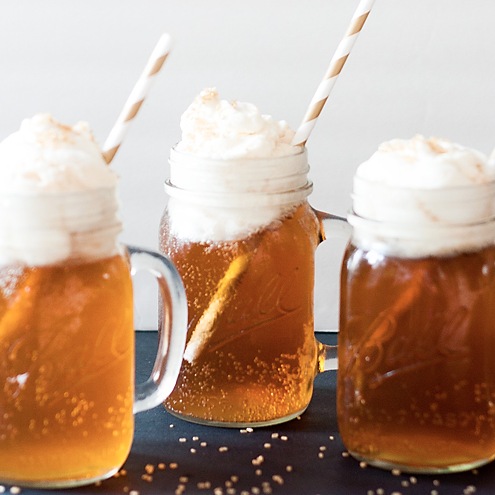 To see all of the posts in this series, click here. 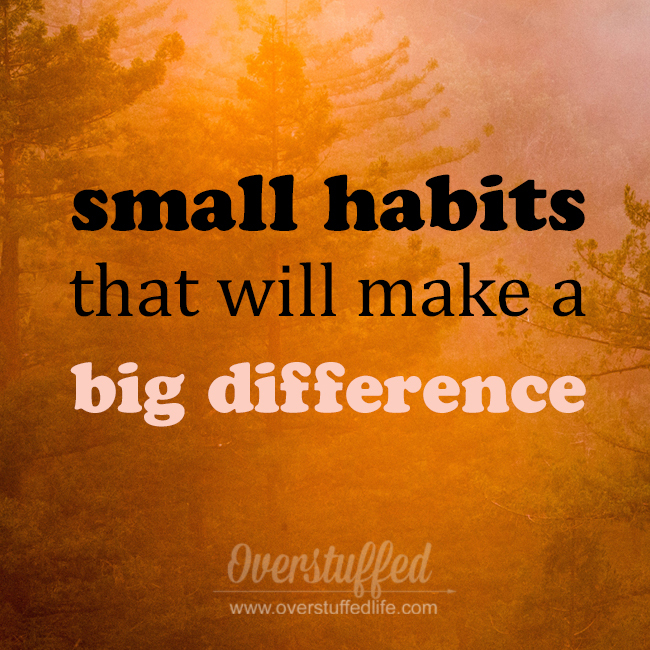 Or, join the challenge and receive a daily email with a new small habit that can affect your life in a big way.